In the southern hemisphere, the low that has formed off the north-east coast of Australia, is now gaining strenght, and is poised to become a tropical storm. It may be a bit late in the season now for a storm to hit northern Australia (if it becomes a TC), as it may require the tropical rain belt (ITCZ) to hang around longer there. 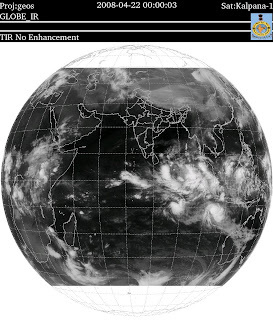 The satellite image from IMD shows the greater cloud mass shifting east, and the formation of the deep low. As a result, the cross equatorial flow seems to be getting diverted towards this formation. Seen in the IMD chart, this diversion '' deflates" the momentum of the flow required to cross the equator. It will now have to seen how much this storm forms and gains strenght. The northern/central heating of the sub-continent continues though, with Nagpur highest at 44c on Monday. ECMRWF and NOAA predict the formation of a low in the Bay around the 28th. But, ECMRWF also shows the low to move towards the Myanmar coast without gaining much. And the seasonal low in the northern plains is forecasted to form systematically by the 27th. at around 1000mb.